This elegant walled estate is truly the apogee of Aldmeri architecture, including a grand entrance hall, curving double staircases, and a blossom-tree garden with circular reflecting pool. Mathiisen Manor is a large player house in southern Mathiisen. 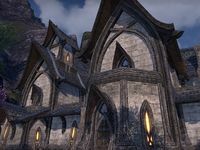 It can be purchased for 010250001,025,000  after earning the Auridon Adventurer achievement by completing 37 quests in Auridon. Or you can purchase it for 064006,400 (075007,500 furnished) without completing the achievement.